It’s the first decent day in what feels like the summer of eternal rain; but I can’t get my hopes up – the outlook for this evening and the rest of the week seems dismal at best. So, MacBook and iced coffee in hand, I’ve spent the better part of the day on the porch, perusing ebay for some essential rain gear I’ve been lacking. The past few weeks I’ve witnessed many people donning wildly printed “go with anything, because they go with nothing” rain boots. The worst offender was wearing a pair with a full on cow face. I can understand how easy it would be to fall into the rain boot trap, all those fun patterns making siren calls, and who wants to wear plain boring black anyway? But keeping my sensible mindset, I scrutinized the 207 results of size 8 boots on ebay, and found a few standout pairs that should keep my dignity and my wallet intact. The first pair, navy blue booties with a starting bid of $5 and $8 shipping. 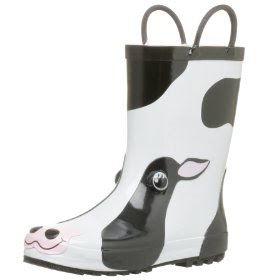 I think the idea of short rain boot is both practical, and fashionable. No worries about overpowering an outfit, simple snaps at the side. 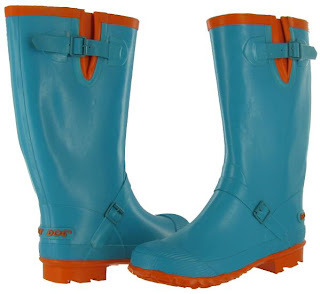 Turquoise is a weakness of mine, and I don’t consider a solid color to constitute a rain boot style nightmare. Yes, the orange accent color does cost it some points, but they could be a cute weekend look. The buy it now price is $20 with $10 shipping, but there is a best offer option, to be taken advantage of. Lastly, this pair of black and white striped knee highs with bright pink accents. I know, the sirens, but black and white is pretty basic, stripes are a respectable print, and a little pink never destroyed my self respect before. Opening bid is $15, with $10 shipping. Also worth noting are these Banana Republic pointy toed booties, with a kitten heel. 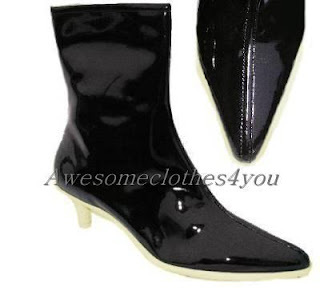 Black patent leather, stylish enough to wear even when not in the rain. Just under $30 shipped. Ahh decisions, what boots are best? I know no matter what I choose I’m going to have to want to wear them again, and again, and again, and hope that some bright shiny new boots will help me to enjoy this endlessly rainy summer. gosh it gets stormy here too these days...i love the first blue and orange AND the navy blue...cute!